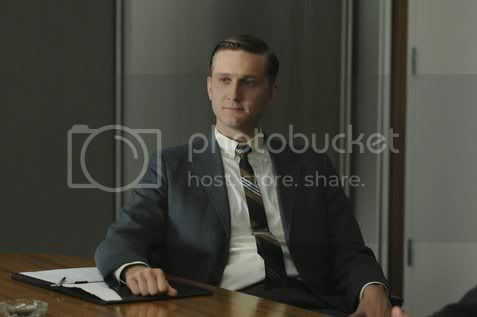 AMC has announced that “Mad Men” won’t return until 2012 for its fifth season. As you might expect, the delay is all about money. In the meantime, the season 4 DVD of “Mad Men” has just been released, so you can get your fix by reliving the exploits of Don Draper, Joan and the gang from the past season. Throughout Season Four, the center of the “Mad Men” universe continued to be Don, as we watched him variously win, temporarily alienate, and sometimes lose clients. After spending the first three seasons of the show as an enigma not only to others but to himself as well, Season Four was a voyage of exploration for Don, both in his personal life and in his career, and it was one which ended with his steadfast belief that he had finally found his future. But anyone who’s been watching this show since the beginning knows damned well that Don’s going to screw things up somehow. The excitement is in finding out how. The biggest storyline for season 5 will likely revolve around Don’s surprise engagement to his hot young secretary, Megan (Jessica Paré), which surprised everyone in the final episode of season 4. If you haven’t been watching this series, the season 5 delay gives you an opportunity to start at the beginning and get caught up. It’s one of the best shows on television so we highly recommend it. 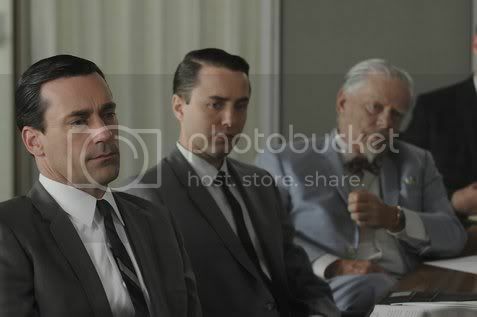 A lot of TV critics spent much of last week trying to work out what would come to pass in this season’s final episode of “Mad Men,” but I can honestly say that I didn’t give it too much thought. The most I did, really, was reflect on how the previous season of “Mad Men” ended, which only served to leave me thinking, “Okay, there’s no way the end of Season 4 is going to leave me as excited about next season as the end of Season 3 did.” And I was right: it didn’t…but that doesn’t mean that Matthew Weiner didn’t still do yet another fine job of setting the stage for the series’ next go-round. Don and Megan: As soon I saw Don start talking to Megan, I said to my wife, “Oh, God, don’t tell me he’s going to ask her to watch the kids for him…” But, of course, he did. I knew that the fire between them was destined to be rekindled at some point during the trip to California, but, really, did anyone anticipate that it would all go down so fast? Even when Stephanie gave Don the ring, I couldn’t imagine that he and Fay would ever actually make it to the altar, but, Jesus, it never occurred to me that, before episode’s end, the ring would be on Megan’s finger…and, yet, looking back at the episode, it’s very easy to see how Don got so caught up in it all. First and foremost, Megan loves the kids and the kids love Megan. Don’s initial line when he walks into the room to a French chorus – “You said you didn’t have any experience, but you’re like Maria von Trapp!” – was hilarious, but it still wasn’t as funny as the expressions on the faces of Sally, Bobby, and Don when Megan kept her cool after Sally’s milkshake spillage. On top of that, she’s gorgeous, smart, and respects what Don does, all of which are important qualities. Still, let’s not kid ourselves: it’s the way she handles the kids that seals the deal. In the midst of post-coital bliss, Megan tells Don, “I know who you are now.” Except she doesn’t. Not really, anyway. But she’ll no doubt find out at some point in the future. Maybe Betty and Fay can fill her in…? Sorry for the delay in knocking out this week’s blog, but I spent the weekend attempting to cover the New York Comic Con, and the end result was that, upon flying home and making it into my house at about 10:30 PM, my attempts to watch and blog the show while wearing my spiffy new “Mad Men” button from NYCC – it has an illustration of Roger Sterling, along with the words, “When God closes a door, he opens a dress” – were interrupted by my complete and utter inability to stay awake. So here we are on Monday morning, and although I’m still pretty freaking tired, I’m at least slightly better rested than I was last night. 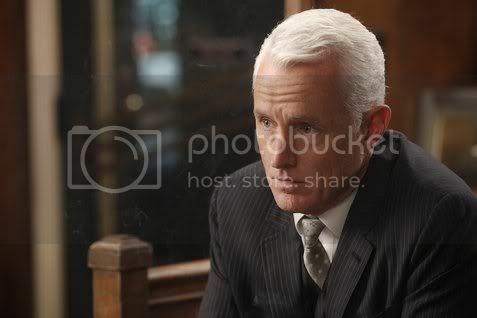 Guess I picked the right button: it’s another episode directed by John Slattery. Things kick off with Don having an off-the-record meeting with a guy from Heinz, trying to get a feel for whether or not the company might be willing to hook up with Sterling Cooper Draper Pryce. It’s clear that he respects Don and his work (though he may just be saying that because Don’s behind his premise that beans don’t have to be funny), but they’re on different timetables. There are two people at that table, but only one of them has any real confidence that SCDP will be around in six to eight months, and, frankly, you can’t blame Heinz for wanting to make sure that they’re working with an ad agency that’s going to have some sort of staying power. Geoffrey Atherthon lays the state of SCDP on the line, using dating metaphors to make his point, and since “tobacco is your ideal boyfriend,” he’s helped provide the firm with a meeting with Philip Morris about their new cigarette line for women. “We will listen more than we will speak,” says Bert, matter-of-factly. “Like a good girlfriend,” smirks Atherton. Immediately after the meeting, everyone begins to break into small camps: Bert and Roger discussing what sort of clients they should be pursuing, Harry and Ken mostly just trying to figure out where they stand in the firm, and Pete and Lane talking about the state of the office and Don saving the day. Meanwhile, Don and Faye are chatting as well, but it’s work-related, so the conversation ends in a handshake, a decision which clearly bemuses Don. I’m guessing it probably wasn’t a coincidence that the shot was framed in such a way that Megan appeared to be between them. When I saw that this week’s episode was entitled “Chinese Wall,” I found myself overwhelmed by a sudden wave of deja vu. “Now, wait a minute,” I thought. “I know damned well that phrase has been utilized before, because I posted the video for Philip Bailey’s ‘Walking on a Chinese Wall’ when it happened.” And, indeed, that was true: Faye made the reference back in Episode 4.9. If you’re not familiar with the term, it’s an expression which, according to the never-fallible Wikipedia, means “an information barrier implemented within a firm to separate and isolate persons who make investment decisions from persons who are privy to undisclosed material information which may influence those decisions.” In this case, the wall in question has been constructed by Roger, and he’s put everyone else on the other side of it. And, now, on with the episode! Hey, look, Peggy’s hanging with the lesbian from Life and her pals, including the guy who pissed her off with his writings a few episodes back. I guess all is forgiven now that he’s asking permission to quote her, since she immediately brings him back to her pad (I was disappointed, though, that Peggy’s reference to her roommate didn’t result in an appearance from Carla Gallo), and a good night evolves into an even better morning. We’re seeing a whole new Peggy, people! Ray Wise in the house! Ken Cosgrove and his fiancee are having dinner with her parents – yep, Mr. 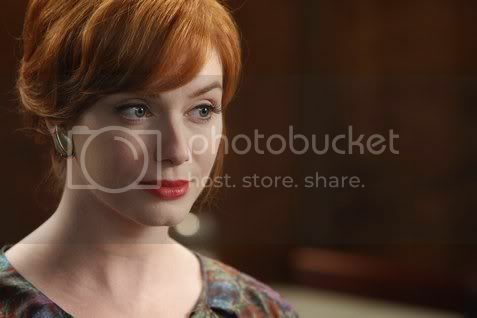 Wise is her dad – when he gets word that Lucky Strike is moving out of business with Sterling Cooper Draper Pryce. As you can imagine, this information scares the heck out of him…so much so, in fact, that he rushes out of dinner and into the waiting room at the maternity ward, where Pete is waiting for Trudy to have their baby. Pete’s immediately on the phone to Don, and although he interrupts his makeout session with Faye to take the call, the topic of conversation instantly puts a damper on his libido. The next thing you know, everyone who’s anyone – minus Lane, of course, though it’s acknowledged that he’s been duly informed – is at the office, ready to pounce on Roger the second he walks in. He claims it’s an impossibility and immediately calls Lee, except we know from his comments that he’s clearly not talking to him. Should I feel sympathetic for Roger? Well, I did, at least a little bit. It’s not his fault that Lucky Strike decided to pull out, and I can’t blame him for not wanting to admit the loss to the firm, but at the same time, he’s clearly getting in over his head with this chicanery, getting a highly warranted smackdown from Joan for keeping his mouth shut when something could’ve been done to save the situation. After she once again relents and lets him swing by her pad, they share a sweet embrace, but even though he’s pretty pitiful when he departs from the premises, she’s seriously disappointed the next day by the fact that he’s continuing to weave his web of lies, and the awkwardness between them is palpable. I don’t think she’d betray him to them, mostly because it’s not like they could save the account at this point, anyway, but his actions are putting her job in jeopardy, too, and I think it’s pretty well established how much she enjoys her niche at the firm. For his part, Roger seems to have been temporarily swayed by the arrival of his book. Maybe he’ll be inspired to become the ad man he once was…? After Bert and Don give the State of the Union address, the feeling on the floor is that everything’s more or less under control, but Don’s not pulling any punches when he sits his team down. The best moment, though, came when it was just him and Peggy. They’ve definitely got their own special relationship now…if, uh, not quite as special as the one she had last night, which has put her in a stellar mood. Unfortunately, it’s pretty transparent to everyone around her, which results in Stan being an Alpha Male to the Nth degree. What a jackass that guy is. 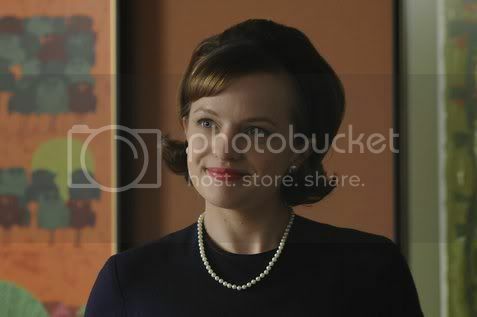 Still, even his minor-league attempt at getting revenge on her for her rebuffing of his advances didn’t do any damage: it takes more than a little lipstick on the teeth to stop the creative force that is Peggy Olson! Joan wants a chat with Roger…and the talk is serious: “I’m late. Very late.” I guess I shouldn’t have been surprised at how Roger immediately did his best to calm her down, speaking to her in a tender voice and assuring her that he’d take care of everything. His doctor, however, isn’t nearly as tolerant of the fact that Roger’s gotten Joan pregnant, but he still passes along information so that she can get an abortion…if she decides to actually get one, that is. Lee Garner, Jr. is back…but not for long. After the Christmas episode, you’d think they’d be glad to see him go away for good, but since Lucky Strike is basically the client that’s keeping Sterling Cooper Draper Pryce afloat, their departure could literally sink the firm. It’s a little disconcerting to see Roger shift from angry into being legitimately upset. Will he be able to save SCDP in 30 days…or before he has another heart attack? 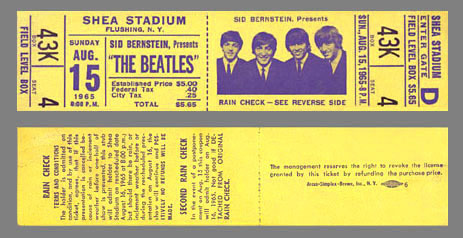 Isn’t it amazing how the promise of a ticket to see the Beatles at Shea Stadium – which dates the events of the episode as taking place near August 15, 1965 – can make up for years of half-assed parenting? But, my God, even Betty’s icy exterior cracked when Don told her where he was taking Sally…and, perhaps even more impressively, mother and daughter actually shared a smile. Unfortunately, the way Don kept having to put pressure on Harry about the tickets, coupled with Harry’s expression while assuring him that he’d get the tickets, had me worried almost immediately that the grand event wouldn’t go off as planned. Little did I know that it’d be the only thing that would pan out.